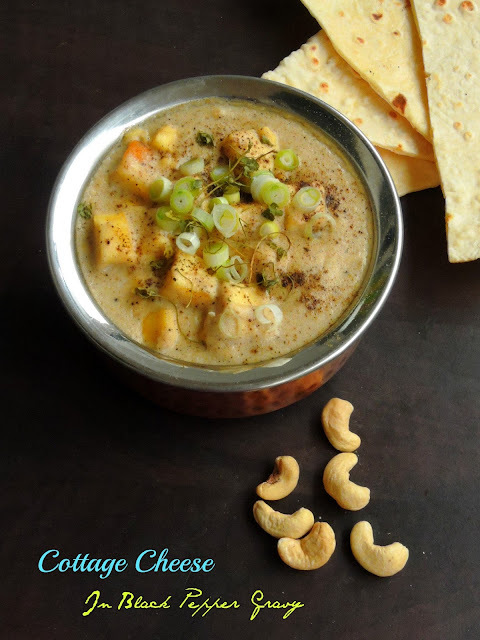 This week's posts are going to be some Gourmet gravies, which you can serve along with rotis or flavoured rice as much as like restaurant's menu. Kali mirch in hindi means Black peppercorns and my today's post is going to be an interesting Punjabi style Paneer subzi spiced with freshly grounded black pepper powder. This subzi came out extremely luscious, very rich and highly delicious and creamy. This rich and irresistible subzi makes an excellent pair to relish without any guilt with most of the Indian flat breads. Served along with garlic naans, trust me this fingerlicking goodness subzi will definitely please everyone's tastebuds at home. This is the first time am trying this luscious cottage cheese in black pepper gravy, trust me i fell in love with this dish. We enjoyed thoroughly with some kulchas, this dish makes an excellent side dish to serve even along with pulavs and many more one pot meal. 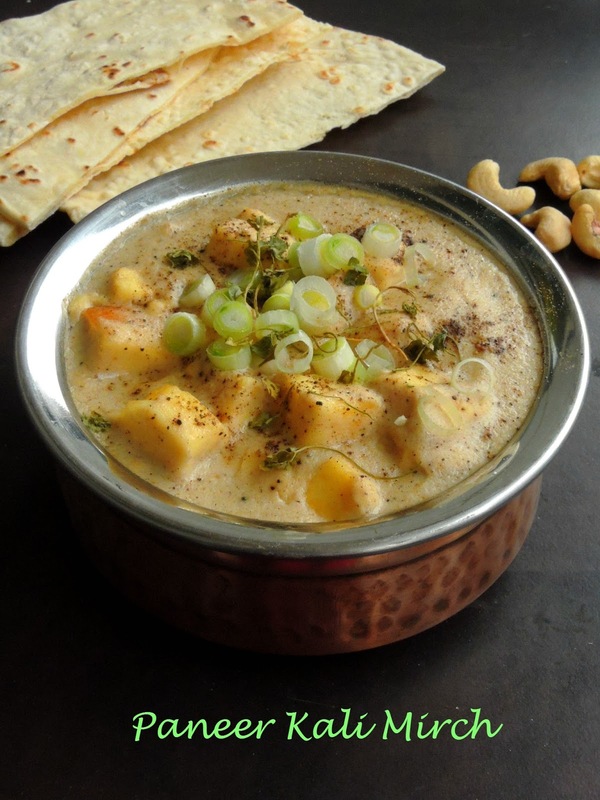 Though i crossed different versions of this Paneer kalimirch while googling, i picked mine from Tarla Dalal's site. Very easy to make this subzi gets ready quickly than you can imagine. This Paneer kali mirch is going to be a part of this month's blogging marathon as am running Gourmet Gravies as theme for this week. Grind all the ingredients under the list 'to grind' as fine and thick paste. Heat oil in a pan, add the paste and saute in medium flame until its turns thick. Add the fresh cream, milk,garam masala, black pepper powder, salt and cook again in medium flame, dont forget to stir continously. Add the paneer cubes, mix gently and cook in medium flame. Put off the stove and serve immediately with Indian flatbreads. The gravy looks stunning Priya..what a lovely one to dig in! Your curry looks really inviting. Loved the paneer kali mirch recipe. Great pick! Love this one. It's a delight to look and I am sure it tasted awesome. That is one creamy, rich and delicious looking curry Priya. My mouth is watering looking at the pics. 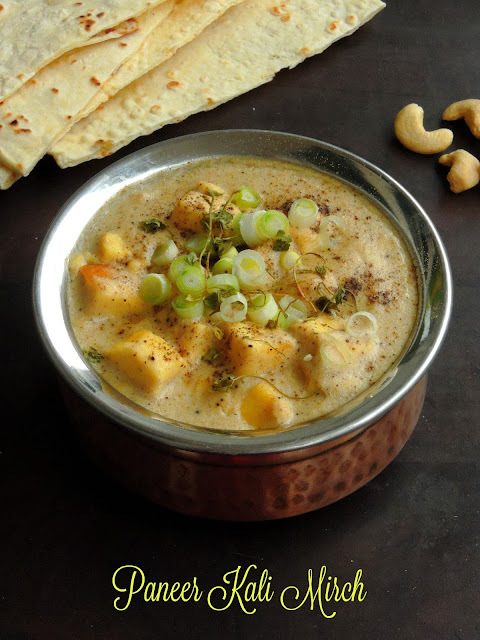 Excellent preparation with paneer..looks fantastic and perfect with rotis. Simple gravy with great flavors. Gravy looks wonderful and a mouthwatering side dish for flat breads.